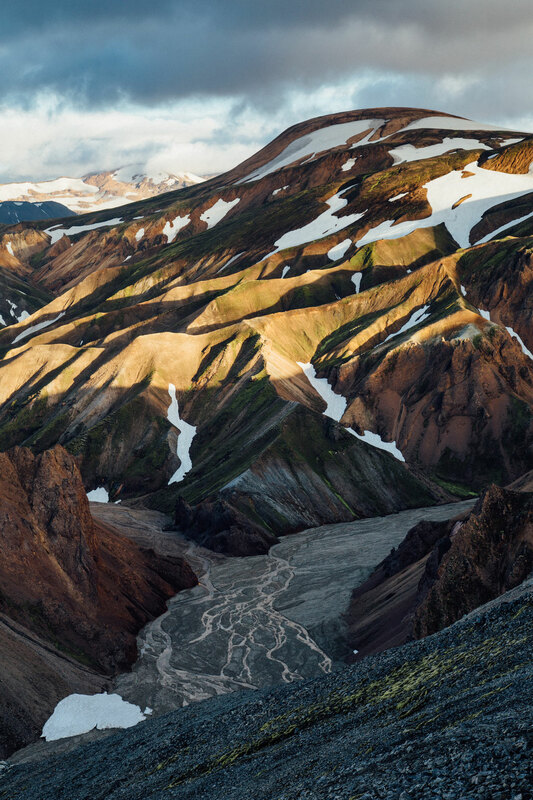 When I was doing research for my trip to Iceland I looked at countless photos on instagram and google, but none of the places made a bigger impression on me than Landmannalaugar. From the moment I first saw images from this place I knew that I will definitely have to include it on my road trip Itinerary around Iceland. The highlands of Iceland are, in my eyes, home to some of the most interesting places on the planet that I have had the chance to photograph. A cross between New Zealand's rolling hills and the colourful mountains of the Bolivian Altiplano. Sounds perfect right? Here is the catch. Planning a side trip to Landmannalaugar from the Ring Road isn't as straightforward as looking it up on the map, typing it into GPS and driving there. The roads there are not paved and depending which route you have chosen to drive on, there could be many river crossings along the way. 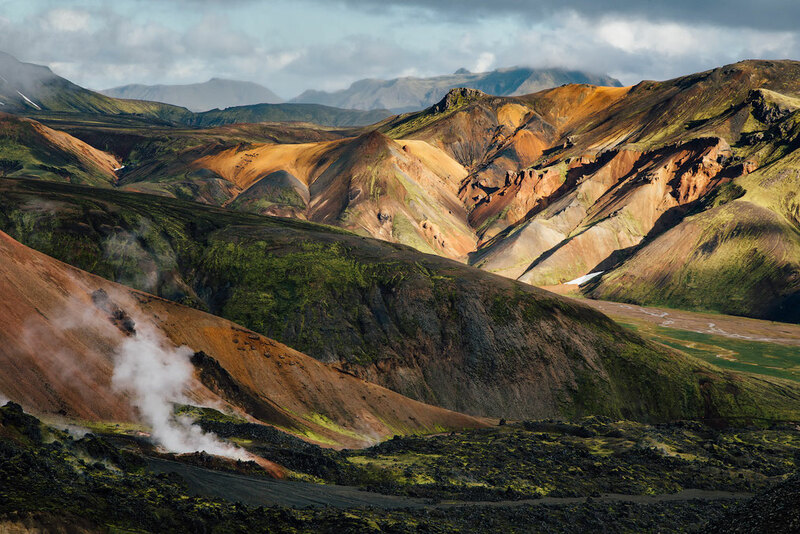 The effort, however, will be well worth it and you shouldn't skip Landmannalaugar when planning a road trip to Iceland. exciting way, the way I did, by self driving. Sunset from the top of Blue Peak. 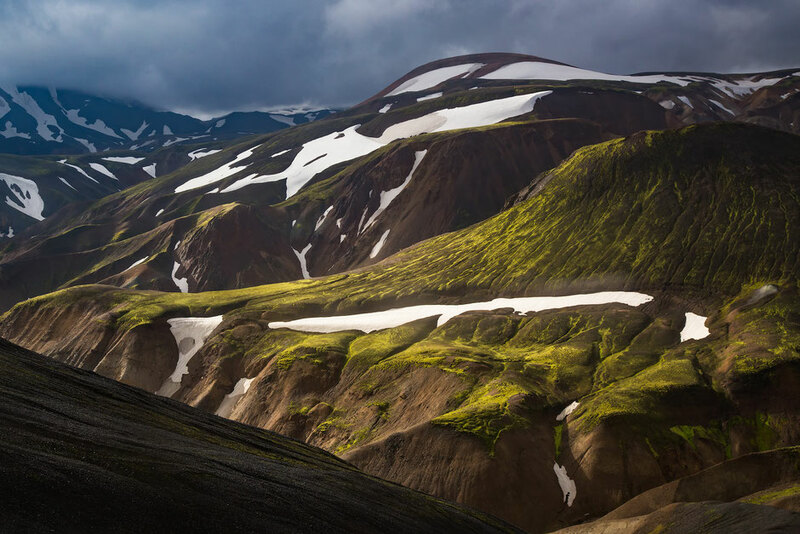 There are three main roads leading to Landmannalaugar. The easiest and most popular one is F208 from the north (Red route on map). The second easiest route is the F 225 from the west (close to mt. Hekla, green route on map). The third and hardest, but probably the most scenic is F 208 from the south, entering directly from highway number 1 (Route blue on map). At the time I didn't know about the first two roads, and as my itinerary was taking me along the southern coast I chose the third road. I've got to say it was quite nerve-wracking having to drive through countless fords in the pouring rain, but after ca. 3 hours of slow driving I reached the destination. Under no circumstances should you attempt driving the roads to Landmannalaugar in a compact rental vehicle. A 4x4 car is a must! Before you rent your car also make sure that taking it on the so called F-roads is allowed and that you are comfortable with river crossings. Those dreaded F roads are defined as windy, mountainous, gravel roads with no bridges and river crossings. They are NOT open all year round to the public. Depending on water levels and snow fall they could be opening slightly later or earlier but in an average year the F208, opens in the middle of June. Just remember to check before you start driving. Road.is provides information about current road conditions in the Icelandic highlands. 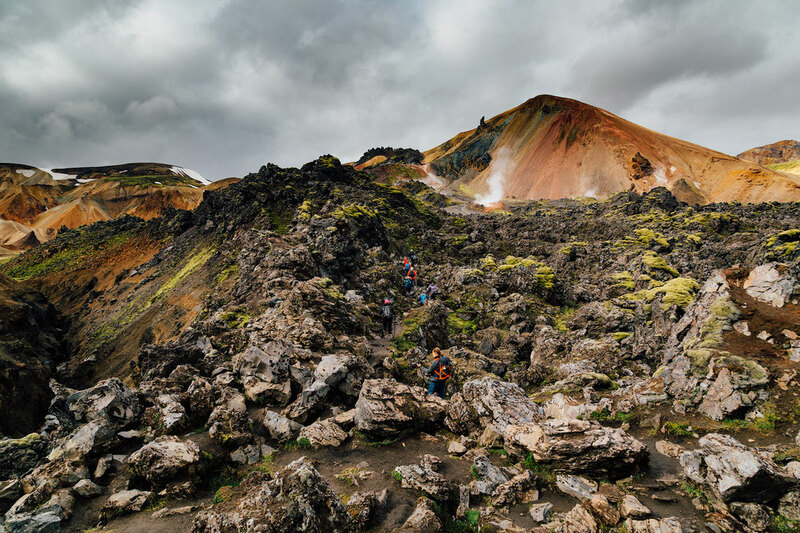 If self driving through rough roads doesn't sound appealing to you, or if renting a 4x4 is not not really your idea of budget travel in Iceland, there are several bus transfer options to Landmannalaugar. 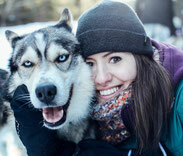 You can book return ticket from Reykjavik and stay at the campsite or in the huts for a night. 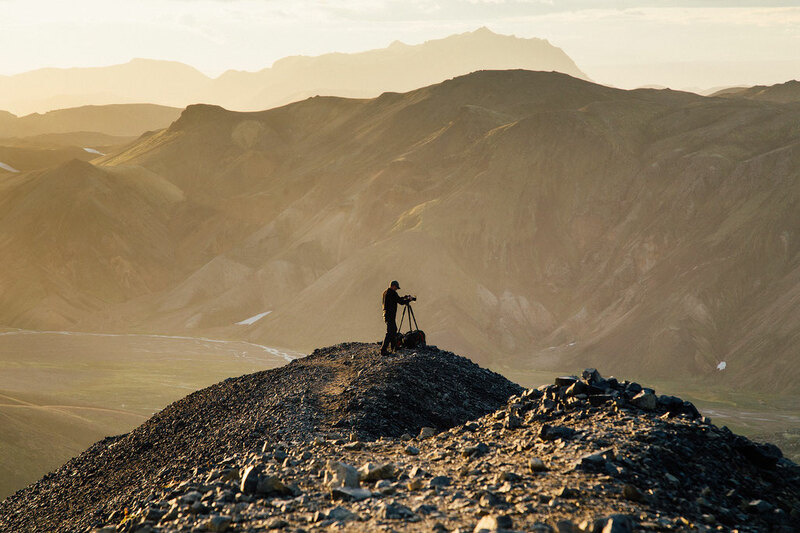 I would highly recommend staying at least one night in Landmannalaugar to get a taste of the surroundings and to do at least one hike in the area. A bus company called Trex covers all these options. As everything in Iceland, bus transfers aren't cheap. A return journey will set you back ISK16400 (ca. $150 USD). If your time in Iceland is limited, but you don't want to miss out on the highlands, you can also book a day trip from Reykjavik either on the first or last day of your stay in Iceland. 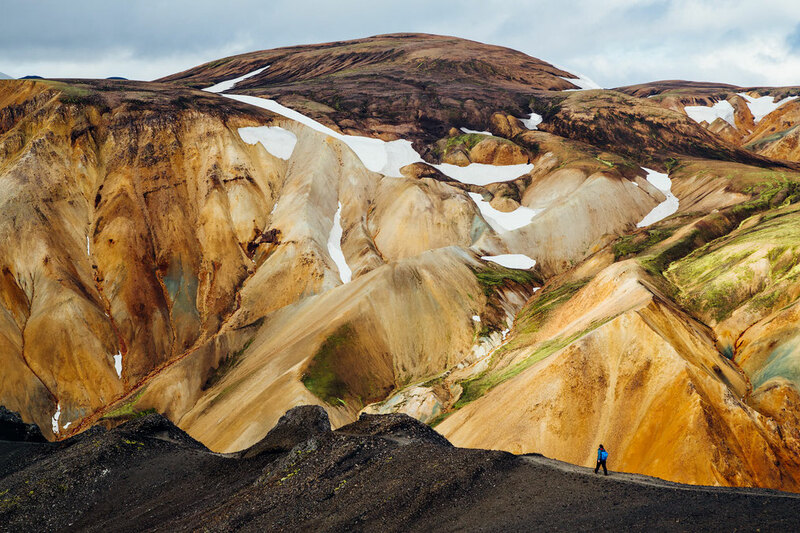 The downside of the day tour though is that it won't give you much time in Landmannalaugar, but again it's a great option for someone who doesn't have much time in Iceland. The only accommodation available in Landmannalaugar is the campsite and the huts. There are no hotels, supermarkets, no petrol stations or any other major signs of civilisation. Make sure you’ve got enough food/petrol for not only your time there, but also for your return journey. The huts at Landmannalaugar cost 9000 ISK (70€, 90$USD) per person per night and book out well in advance. The bookings can be made on Iceland Tourism Association website. A safer and certainly cheaper option is to bring your own tent and camping equipment. The campsite is quite busy in the summer months and operates on first come first serve basis. The cost per person/night is 2000ISK (17€, 20USD) and showers/toilets are not included. Use of the facilities costs 500ISK per day. So, if like most people, you like to use toilets, your total cost will be 2500ISK per person/per night. After you register in the office you will be given a wrist band, which will say that you have paid for the usage of toilets. I honestly didn't understand why the prices weren't including all facilities, but then again, not my country, not my rules I guess. The best thing about this campsite has to be the natural hot springs. After a days hiking coming back to soak in the tub is one of the best feelings. The steam from the springs is clearly visible from the campsite and the rotting egg smell is very distinct, especially when the wind is blowing your way. What’s weird as well is that, there is no charge for the use of the hot springs. It must be the only free thing in otherwise very expensive Iceland haha! 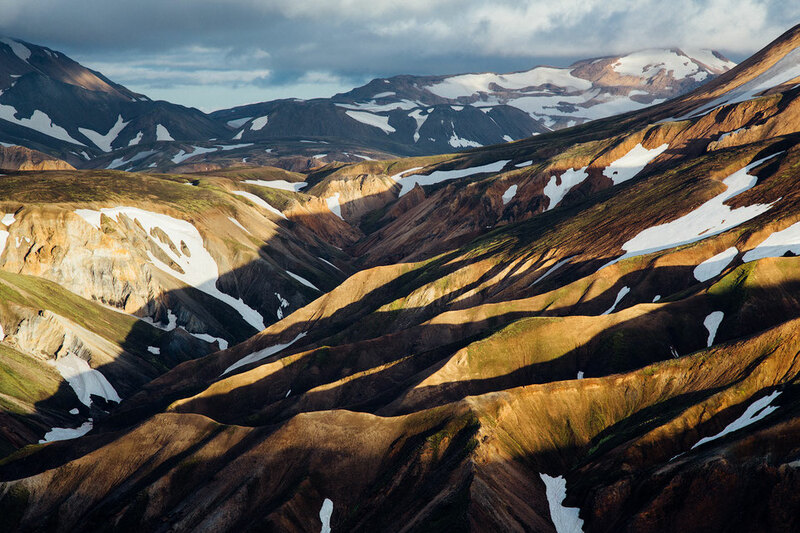 Landmannalaugar is where the popular multiday Laugavegur Trek starts. 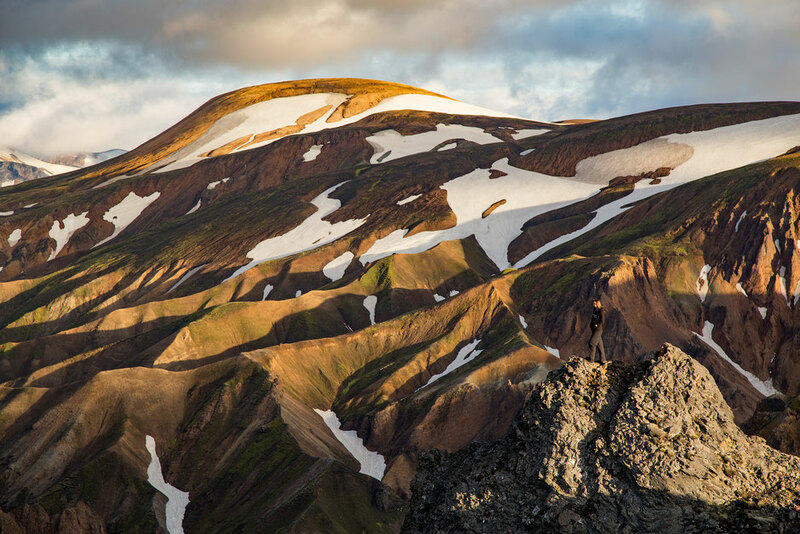 This 55km trail leads all the way to Thorsmork through some of the most dramatic landscapes in the highlands. 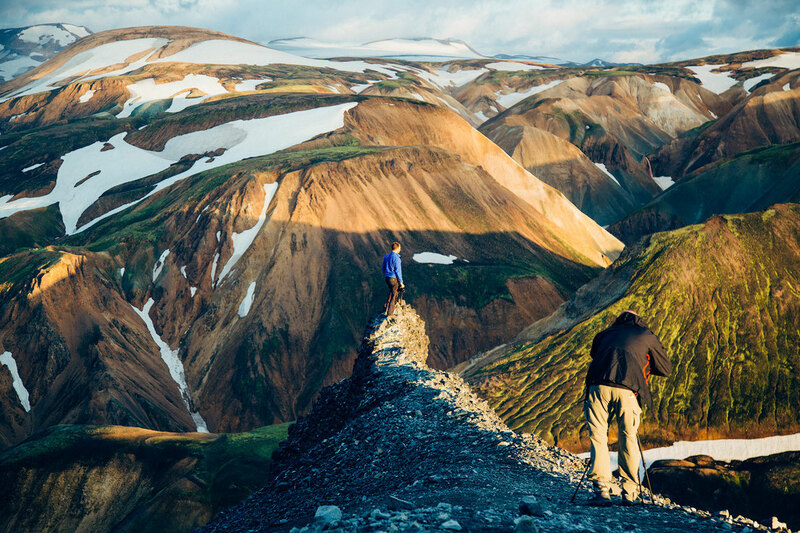 I learned about this hike from others staying at the campsite in Landmannalaugar and I definitely plan on doing it in the future when I return to Iceland. In this post I will cover a couple of awesome day hikes I have done and I would highly recommend. There’s an awesome loop of the Laugahraun lava field which was formed during an eruption around the year 1477. It starts near the northern point of the campsite and is very rewarding the closer you get to Mt. Brennisteinsalda. You’ll see the steaming fumaroles coming out of the vents near the base of Brennisteinsalda and you will be able to smell it before you'll learn to pronounce it's name. The hike is relatively easy with very little elevation gain and shouldn't take longer than 2 hours. 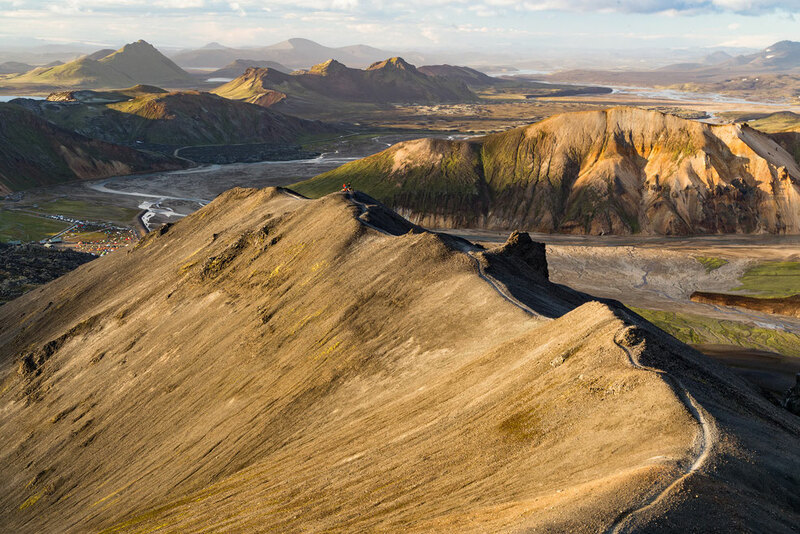 My favourite hike, where most of the photos published in this guide were taken from, takes you up the Bláhnjúkur mountain to the south west of the campsite. Bláhnjúkur translate to Blue Peak in English and got its name from the shimmering blue-black colour of its sides. The views from the top are jaw dropping. This rugged terrain literally rose from the lava and ashes of the surrounding volcanoes. 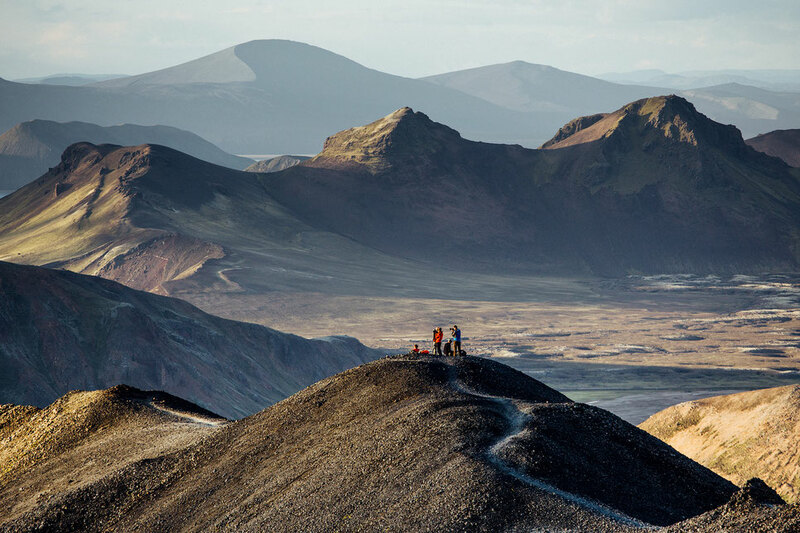 Once you get to the top you'll get the 360 degree view of the Laugahraun Lava field and the colourful rhyolite peaks encircling it. Truly a photographers paradise. 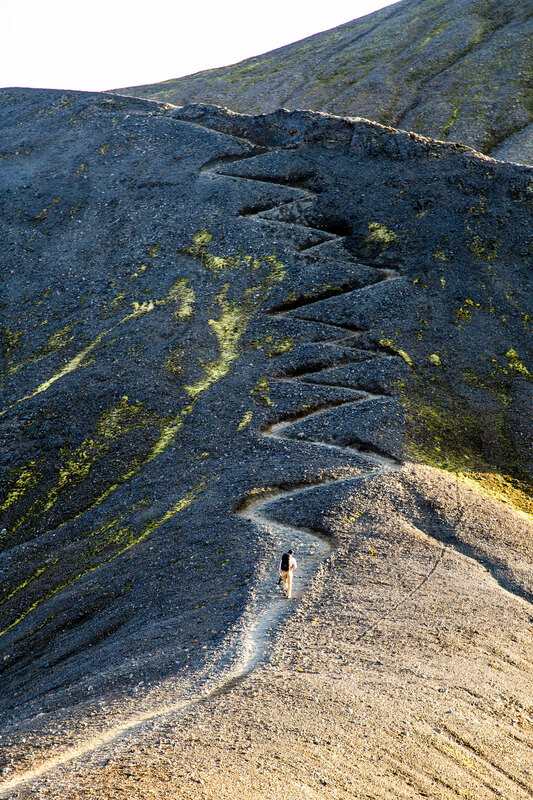 The hike up Bláhnjúkur can be turned into a loop. From the summit you can continue along the ridge line to the other side of the mountain, down into the valley and back to the campsite past the Laugahraun Lava field. It’s only around a 5km loop and can be done in around 3 hours. It’ll probably take you a lot longer with photography stops though. To get to the top of the peak it took me around 1,5 hours. The terrain is really sandy, but the path is very well maintained and easy to follow. The trailhead is easy to find and the hiking path is visible from the campsite. I've done the hike up Bláhnjúkur twice in one day. First one during the day, turning it into a loop, which I mentioned before, and the second time I went up for sunset. Soaking in the nearby hot springs afterwards felt twice as good afterwards! The pathway up the Blue Peak. I have visited the highlands in August, some would say the middle of European summer. However I don't think summer ever comes to Iceland. The temperature at night was around 0 degrees and daytime wasn't exactly t-shirt weather either. If you plan on camping and don't want to freeze at night I would definitely recommend bringing a warm sleeping bag, an insulated sleeping pad and a lightweight three season tent with a decent waterproof rating. All products I have linked to are the ones I own myself and highly recommend. I've used them extensively on my hiking trips across Canada and New Zealand and tested them in all kinds of weather conditions. As for clothing goes I don't go out on hikes and outdoor trips without my Fjallraven trousers and jacket. I also always bring windproof gloves and a buff especially on morning or evening hikes when the temperatures can vary greatly between daytime and nighttime. 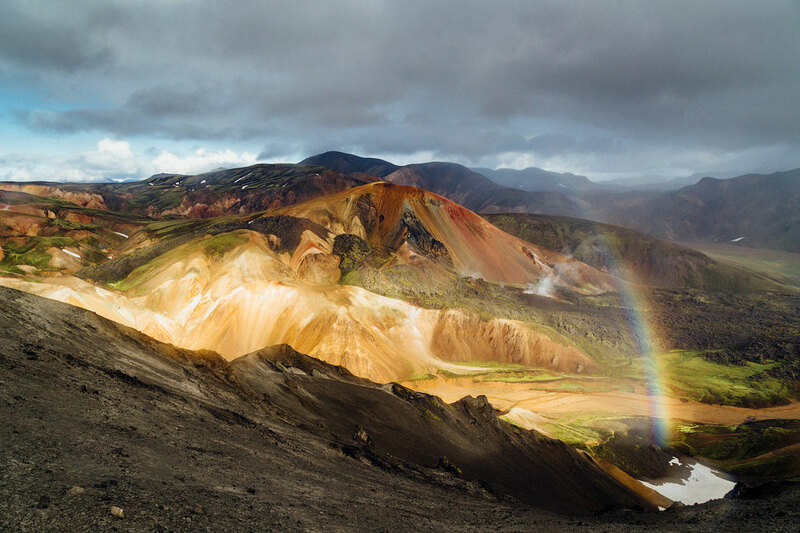 I hope I convinced you to get off the beaten path in Iceland and visit Landmannalaugar! If you have any questions don't hesitate to ask me in the comments or contact me directly. Have fun in Iceland!